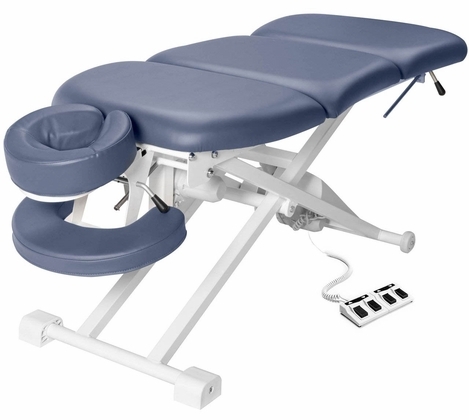 The adjustable head and armrest affords luxurious comfort and allows a patient�s shoulders to fully relax. � A rugged steel frame, durable and reliable CE and UL listed actuator, at the step of the foot control, the table easily adjusts from 21" to 34". � The 550 lb. Weight capacity secures and lifts large patients with ease, while the low 21" height setting simplifies difficult patient transfers. � The infinitely adjustable 4 section table top includes power-driven raising mid-section, raising leg section, a sturdy head-cradle and armrest and an ergonomically designed contoured top. � 2.5" thick cushion of Multi-Layer Small Cell foam, patented to be more dense than standard foam. The Royal Blue PU upholstery is oil- and water-resistant, CFC-free and with denim-like reinforcement backing for extra durability. It's protected by a 5 Year Guarantee. � Maximum working load: 550 lbs. � Height range: 21"- 34"
� Padding: 2.5" thick cushion of Multi-Layer Small Cell foam.